Visit Inline Skates online at InlineSkates.net where you will find anything and everything you need for inline skating. InlineSkates.net has what you are looking for whether it's inline skates for fitness or recreation, aggressive skating, roller skating, or roller hockey, you will definitely find it at InlineSkates.com. InlineSkates.com offers brands such as K2, Rollerblade, Riedell, Remedyz, Razors, Mission, Roller Derby, Pro-Tec, and many more. Visit 58coupons.com for the best Inline Skates coupons, Inline Skates codes and Inline Skates promotions. Now you can save $10 on your $100 order at InlineSkates.net. Click link and use the coupon. 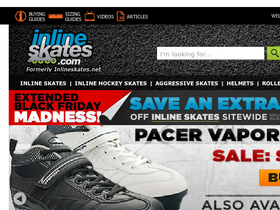 Now when you spend over $49 at InlineSkates.net you will enjoy free shipping. Click link to begin. Right now you can save up to 60% on clearance items at InlineSkates.net. Click link to start saving. Get a free backpack (valued at $50) with any purchase of a 2010 Women's Rollerblade brand Inline Skates over $180 from InlineSkates.net. Click link to shop. Buy any 2010 Aggressive Skate over $199 & receive a free Pro-Tec Ace SXP Skate Helmet (valued at $45) from Inline Skates. Click on link code to view. Act now and get a free skate bag (valued at $25) when you order select skates from InlineSkates.com. Use coupon code at checkout to save.